KUOW's Front Row Center series usually has an event at the Seattle Symphony each year which we both normally attend (Melody also goes to most if not all of the other events.) Since it was set for a Saturday evening, we spent the latter part of the afternoon in Downtown Seattle. Our first destination was the Central Branch of the Seattle Public Library since we had a coupon for half off at the Chocolati kiosk, where we each had hot chocolate and truffles. Since we had plenty of time, we headed up to the top floor to hang out for a bit; I hadn't been in the library with the sun at that particular angle before, and I liked the pattern it made. Once we were ready for dinner, we walked a few blocks to eat some poke, then a couple blocks over to get some gelato for dessert. 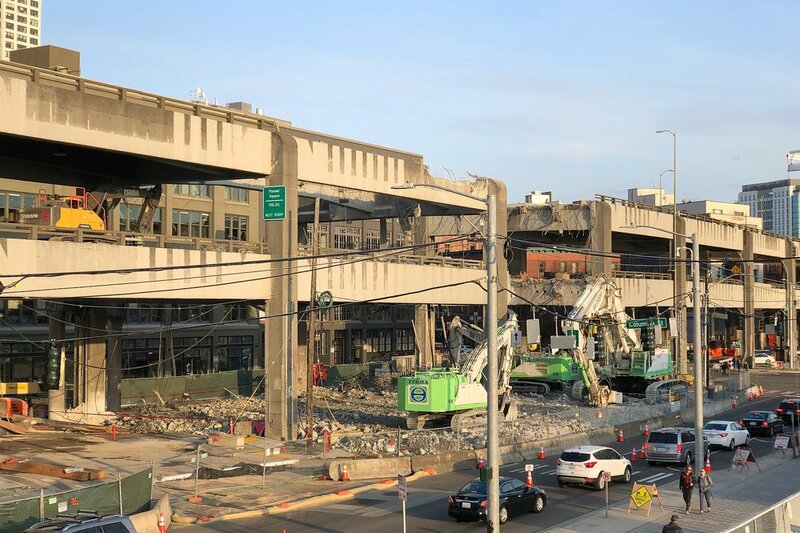 We still had plenty of extra time, so we walked along Alaskan Way to take a look at the progress being made demolishing the viaduct. As it ends up, there wasn't much around Union, so we started walking south. By the time we crossed Marian, we could see the section connecting to Columbia was completely gone. Walking along the temporary pedestrian walkway to Marian, we made our way back to Benaroya Hall. Before the concert started, Larry Starr (in the UW Music Department) interviewed John Harbison, who was commissioned for the second piece of the night, What Do We Make of Bach? (for both orchestra and organ.) He talked about how the different way an organ plays notes than all of the orchestra instruments (it has a constant tone at a constant volume until the key is released) meant he had to take care when everyone was playing together. The piece is a companion to his book of the same title. Starr and Harbison also briefly touched on the other pieces in the concert. We then worked our way about halfway up the orchestra section to our seats and settled in for the night's performance. Knowing that the organ was going to be used during the evening and seeing Bach's Toccata and Fugue in D minor on the program (you may not realize you know the piece; think of any horror film where you hear spooky organ music, and it's probably the Toccata and Fugue) but this was actually a transcription for orchestra done by Leopold Stokowski. You can really hear the difference between the organ and the orchestra. The opening strings seem a bit less agile than the keyboard, but the sound is definitely there. It does sound fuller than on the organ, but it doesn't have that deep, throaty feel you get with the big pipes, not to mention the reverberation you would hear in a big church. It was still interesting to hear, and well-executed by the symphony. John Harbison's What Do We Make of Bach? was commissioned by the Seattle Symphony along with the Minnesota Orchestra and Northrup at the University of Minnesota. There's an accompanying book by the same name. With the title, the first thought when the piece begins is it doesn't sound like Bach at all. But listen more and you can see that it was inspired by the Baroque composer. The organ blends in like another piece of the orchestra, and it does get some solos. It does, however, get its chance to hold a big, room-shaking chord at the end. I hadn't heard Shostakovich's Symphony no. 15 before; it's pretty long, and does have echos of Bach in it as well. From the pre-concert talk, we were expecting to hear bits of the William Tell Overture (you know that one too; think the theme for The Lone Ranger) but there were good-sized excerpts in a few places. And instead of trying to sneak it in, they felt almost dropped right in the middle of things, then the orchestra works its way out of it and back to the rest of the symphony. Overall, the Shostakovich seemed pretty intricate, yet still quite accessible, and the audience seemed to really enjoy it. Right after the concert was over, Marcie Sillman set up shop in the lobby, and before too long, conductor Ludovic Morlot and organist Wayne Marshall joined her for a quick Q&A session. We happened to be sitting across the aisle from Sillman during the concert, and right after it finished she marveled at how wild the Shostakovich sounded. It struck her so much, that was the first thing she brought up. Morlot talked about how it was written at the end of Shostakovich's life, and how much he enjoys the piece. It was hard to avoid the fact that this is Morlot's last season as the Seattle Symphony conductor, but he made a point to express how much he's enjoyed being here and how much he's grown musically. We've seen an amazing change in the Symphony since his arrival, and it will be sad to see him leave.